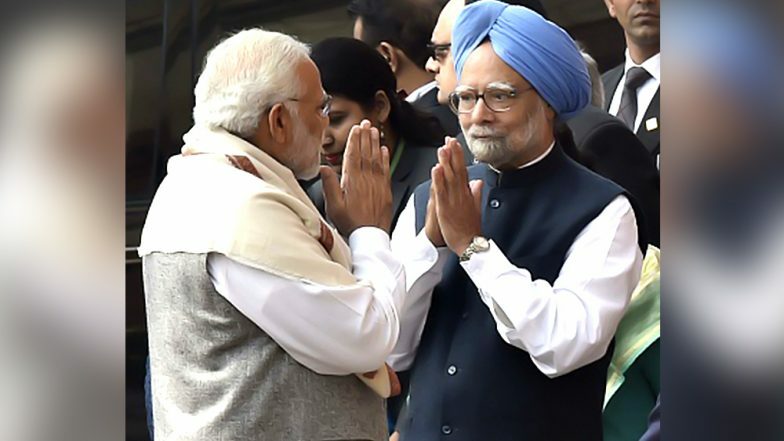 New Delhi, December 18: Former prime minister and economist Dr Manmohan Singh on Tuesday took a dig at current Premier Narendra Modi for not facing the media in last four-and-half years. He accused Modi of being afraid of the press asking him questions on his foreign tours and cited his example on how he (Singh) briefed the media. Expressing his opinion, Congress leader said, “People say I was a silent Prime Minister. I think these volumes (his book 'Changing India') speak for themselves. I wasn't the PM who was afraid of talking to the press. I met press regularly, and on every foreign trip I undertook, I had a press conference on return.” PM Modi Must Exercise Restraint, Should Set an Example with Conduct, Advices Manmohan Singh. Among other things, he attacked the BJP-led Union government for the tiff with Reserve Bank of India and the governors. Hinting at the tensions between the central government’s unlikeness with Raghuram Rajan and Urjit Patel, the former premier stated that he expects good relations of the government and the central bank chief for the betterment of nation’s economy. Singh was reacting to the tensions and reserve issues which ‘allegedly’ led to the resignation of former RBI governor Urjit Patel last week. Hoping that good relations and peace will be bestowed between the two parties after the appointment of former economic secretary Shaktikanta Das as RBI governor, the economist-turned-politician advised the government to find ways to work in harmony with each other. Manmohan Singh Says Urjit Patel's Resignation as RBI Governor a 'Severe Blow to the Nation’s Economy'. The former PM also said that the Congress government had vowed to the people that they would waive farmers’ loans, if elected to power, and their respective state governments in Rajasthan, Madhya Pradesh and Chhattisgarh fulfilled that promise.